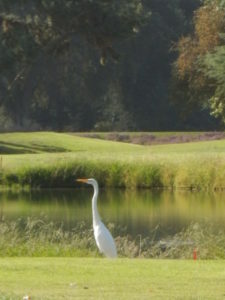 WOODBRIDGE, CA – Golfers playing at Woodbridge Golf & Country Club have recently noticed the club attracts more wildlife than the typical area golf course. That’s because Woodbridge Golf & Country Club has achieved designation as a “Certified Audubon Cooperative Sanctuary” through the Audubon Cooperative Sanctuary Program for Golf Courses – a process the club began about two years ago. Jim Husting, Certified Golf Course Superintendent, led the effort to obtain sanctuary designation on the property and is being recognized for Environmental Stewardship by Audubon International. Woodbridge Golf & Country Club is one of 71 golf courses in California and 914 in the world to hold the title of Audubon Cooperative Sanctuary. “Woodbridge Golf & Country Club has shown a strong commitment to its environmental program. They are to be commended for their efforts to provide a sanctuary for wildlife on the golf course property,” said Tara Donadio, Director of Cooperative Sanctuary Programs at Audubon International. “To reach certification, a course must demonstrate that they are maintaining a high degree of environmental quality in a number of areas,” explained Donadio. These categories include: Environmental Planning, Wildlife & Habitat Management, Outreach and Education, Chemical Use Reduction and Safety, Water Conservation, and Water Quality Management. The 92-year-old Woodbridge Golf & Country Club is located in the heart of Lodi’s wine country and features 27 distinctive holes on its three championship courses. The private club also features a clubhouse with family dining and social events, fitness classes, a year-round heated swimming pool and seven tennis courts, making it an attractive local destination for both young families and the young at heart. For more information about the club, please contact Kristine Roberson, the club’s Membership Director, at 209-263-0115 or kroberson@woodbridgegcc.com. Or visit www.woodbridgegcc.com.